It helps to understand the sheer scale of the conquest. No Roman Emperor, no British monarch ever controlled more of the planet than the Mongols. The grand sweep of the Khans took them west into Europe, east into China and south to Java – the largest contiguous land empire in world history. As the text books tell us, Tenggeri, the sky god of the Mongols, gave Genghis Khan the mission of bringing the rest of the world under one sword. He near enough succeeded. Mongolia no longer has aspirations to bring the world’s citizenry under its control, though it is determined to entice as many of them as possible to its sumptuous realm, where the Central Asian steppe, taiga forests, blue lakes, the Altai mountains and the Gobi Desert meet in a high landlocked plateau between Russian Siberia and northern China’s plains. 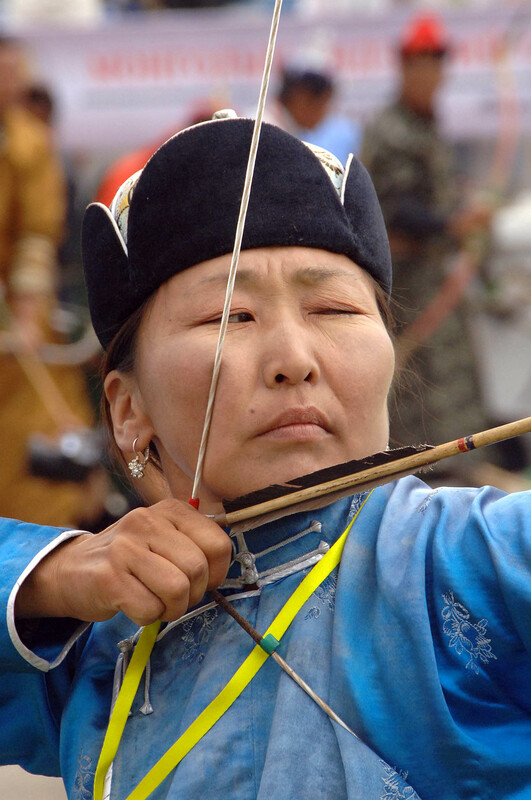 Of the mighty array of attractions, there is none more potent than Naadam, one of the most dramatic and exhilarating events of its kind in the world. A summer festival believed to have existed in some fashion for centuries, it is a Grand Final of sorts, a summit playoff of horseracing, archery and wrestling events (the ‘Three Manly Sports’, with some earnest knucklebone throwing tossed in as well) staged during the year throughout a country the size of Alaska peopled by only two and a half million. But, more importantly, it is an affirmation of the Mongolian spirit. To witness ranks of riders surging into the central stadium of Ulaanbaatar on the same compact, sprightly horses that the great Genghis rode into battle – surrounded by athletes, monks, dancers, soldiers, musicians and nomad herders – is to glimpse the grandeur of a civilisation that shaped the world as we now know it. Then to see horses race, at ferocious pace, in their hundreds through vast valleys, while tens of thousands cheer them on; and to observe rotund but almost balletic wrestlers trounce an opponent and then prance across an arena in a traditional victor’s Eagle Dance, is to be enveloped in a culture of extraordinary strength. Though fiercely proud of their rich heritage, modern Mongolians are neither hostile nor warlike; a hospitable warmth is at the heart of their collective character. And while some visitors venture into seemingly untouched terrain where a GPS co-ordinate is more useful than an address, they first pass through a city of shopping malls, supermarkets, boutiques, restaurants, yellow cabs and mini-skirts. Unexpected contrasts pile one atop the other. A Lenin statue a block from a swish fashion catwalk, a 4WD sharing a road with a yak cart, a plush western hotel a short drive from a ger (traditional round felt dwellings) camp. Some stately buildings are topped with massive signage from the days when Moscow called the shots, patriotic exhortations ranging from Let’s Improve Mongolia to May Mongolians’ Faith Always Improve And Develop Like Their Fire. Nowhere are these contrasts more intriguing and more rewarding than in Mongolia’s startling wealth of music and performance arts. There is a spectrum of sound that can scarce be believed. At one end, the grand and sweeping classical orchestras, sustained in showpiece style by the Soviets over decades but thoroughly Mongolian in their use of local compositions, and traditional performers playing the Horse Head fiddle and other Mongol-designed lute, wind and percussion instruments. At the other end, a range of powerful rock bands of long standing – Jargalsaikhan, Chinggis Khan, The Hurd and Haranga – whose CDs are stacked in Tokyo-type record shops alongside the offerings of hip hop, rap, dance and new age entities such as Saraa, Funksta, Gennie, Urna, Hulan and, famed for the anthemic Born In UB, Masta Flow. And straddling them both – acclaimed and ethereal Mongolian throat singers such as Booyoo, who somehow simultaneously bring forth from their voicebox both high and low notes in spell-binding manner. There is so much pouring out of this long locked-away country that it is hard to keep up with it all. Those who come expecting to be confronted by the past in a nation that has just celebrated its 800th birthday are soon caught up in the present, with promise of the future. Jasper Becker may have titled his essential book on Mongolia The Lost Country, writing of “wandering tribes, prophets, shamans and mystic kings – where the wolf still stalks the wild horse across the treeless plain and where the eagle hangs in the blue sky searching the bare mountains” but what strikes visitors now is a real sense of making up for years lost. Not only those who make their way there – an easier exercise than may be imagined, with relatively brief air links from Seoul and Beijing – but those who seek out at home groundbreaking and award-winning Mongolian films like The Story of the Weeping Camel and The Cave of the Yellow Dog. All carried on under, it would seem, the watchful eye of Genghis Khan, the relentless thirteenth century warrior who fathered over a thousand children and struck fear into more hearts than any leader before or since. The very mention of his name was forbidden by Russian overlords but today it and the accompanying image is absolutely everywhere in Mongolia – from towering statues to vodka bottles, hillsides to t-shirts, banknotes to postage stamps, airports to cultural spectaculars. Leaving you in absolutely no doubt as to where you are and who was there before you. His was an incomparable genetic footprint. Because Genghis (or Chinggis as he is known at home) had a particular version of the Y chromosome and was no slouch when it came to spreading his seed, it has been possible for an international team of geneticists to determine that one in twelve men in Asia, or about 16 million men in total across the planet, today have him as their forebear. A few years ago, a London restaurant, Shish, offered daily DNA tests at its two branches, with free meals to those found to be descendants of the legendary warlord. That promotion was just a tiny part of a global fascination with a late bloomer hailed as a murdering savage on one hand and a wise father of international diplomacy on the other. 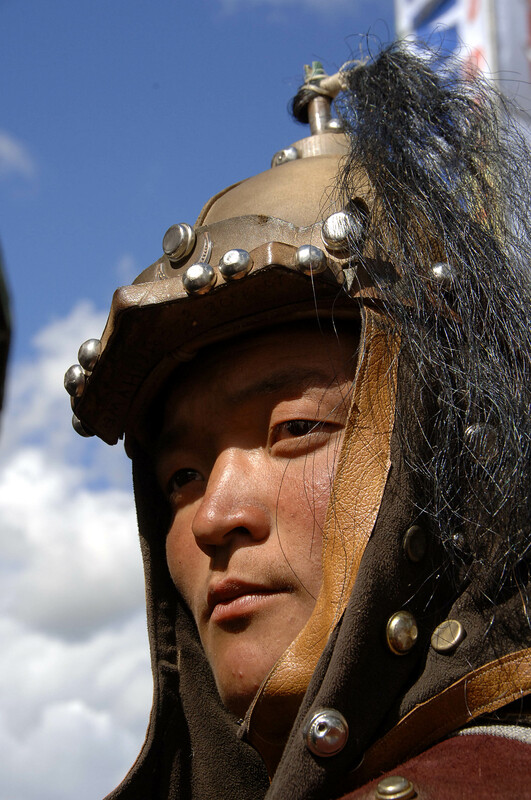 Modern Mongolians are as fascinated by themselves and their heritage as everybody else. In this land without fences, the last “wild west”, where near toxic fermented mares’ milk is swigged like cola, all ride high in the saddle; that is when they bother with saddles. The horse to human ratio is 13 to 1 and there seems to be permanent blur in your line of sight as sturdy steeds fly by. There are popular eight-day horseback expeditions through the mountains outside Ulaanbaatar, undertaken alone or in a group. With the horses as certain of the terrain as the camels are of the Gobi desert, there is a rare sense of absolute unfettered explorative adventure. As agreeable a city as Ulaanbaatar may be, the primary attraction of this country and the principal business of its slew of tour operators, is road trips across its vast surrounds and to its far corners made both possible and comfortable by an uncountable number of Ger (or yurt) camps which have opened up the county to pretty much all-comers with the portable communal tents that have housed nomadic herders for centuries. Now there are refinements – restaurant, modern shower block, gift shop – but the essence is pure. Across steppe, mountain and desert, by blue lakes and under mountain outcrops, this is where you stay and the experience is both agreeable and unforgettable. 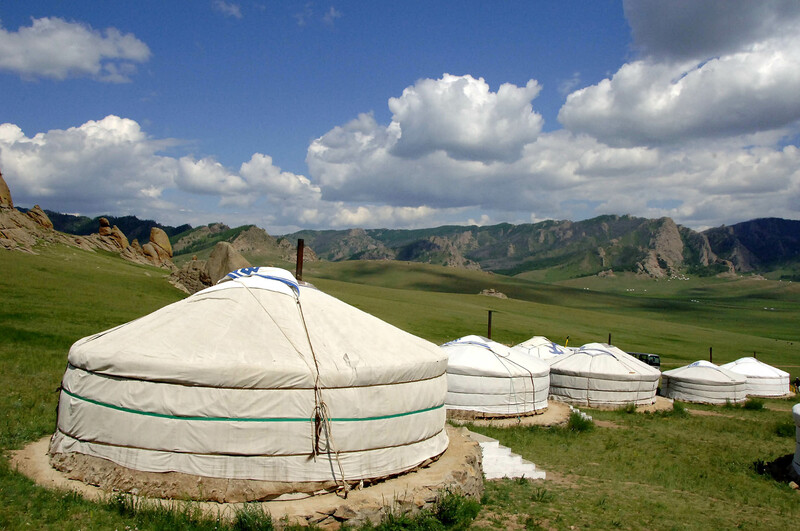 There’s sheep stewed in a pot, yoghurt delivered by passing nomads (half the population qualifies for the term in some way), a brace of swift horses on call, and visiting serenading throat singers and Mongolian movies on a small screen to pack you off to a serene sleep. The ger girl comes by at about 6 AM to stoke your fire. By prior arrangement, of course. Apart from the odd crackle from the steel stove that is the centrepiece of your circular felt world, you hear nothing; she’s done this before. Increasingly popular are two- and three-week expeditions, out to Western Mongolia or in “The Big Loop” that sweeps down south to the Gobi and north to the alpine lake of Khovsgol Nuur. They take in massive dunes, mountains, glaciers, canyons, raging rivers, dinosaur quarries and desert monasteries, with hiking, fishing, riding, swimming, climbing, kayaking, dune sliding and camel trekking integral to the experience. Most of the visitors arrive around July and not just to catch Naadam. Just as Antarctic visitors take advantage of a two month “window” that starts around the middle of December, Mongolian venturers are generally keen to avoid winter temperatures that descend to minus 30 centigrade. As your Lonely Planet guide will warn you, “Ulaanbaatar is possibly the coldest capital city in the world”. But in July and September the dust storms have settled, the days are warm, you’re still taking photographs at 10.30pm without need of a flash, the skies are clear, the air is pristine, and the atmosphere enormously amenable. Ulaanbaatar is not just a gateway to Mongolia. Take the two-and-a-half hour Korean Air flight from Seoul and you can join the daily sleeper train that will take you, with a connection, past Lake Baikal and on to Vladivostock, or link you to the Trans Siberian Express. Next door is the equally vast Kazakhstan, with its own array of compelling societies and terrains. (its cloaked eagle handlers cross the border to entertain tourists). Freed of the Russians, indifferent to the Chinese, the Mongolians have eagerly aligned themselves with the globalised world, claiming the right to pick’n’choose, with feet in myriad camps, whatever comes their way. With one foot in the thirteenth century and another in the twenty-first, they are a people to contend with. Capital-dwellers eagerly frequent a branch of the Californian-based Mongolian Barbeque chain, even though, as one young patron admitted, the expensive fare on offer bears little relationship to anything ever served at her family table. It’s all about the thrill of the new and there’s no shortage of that. Yet it is the thrill or at least the promise of the very ancient, the uncovering of things once hidden, that is bringing the world to Mongolia. If there’s a red carpet at Ulaanbaatar Airport, it would be rarely rolled up. In recent years, a path has been beaten to the exotic and intriguing land by an illustrious array of planetary citizens. Not just George W. Bush and Vladimir Putin but the Dalai Lama, Kofi Annan, Jimmy Carter, a Chinese premier, a Japanese prime minister and prince, a Thai princess, Turkish, Vietnamese, Hungarian and South Korean presidents, a Canadian secretary of state, a UNESCO director-general and Julia Roberts, who went to live with nomadic horseman and learned to milk yaks. But then, given a chance, who wouldn’t? It’s a mental checklist sort of place, a destination that even the vaguely adventurous factor in for some stage of their travelling life. So cogent is Mongolia’s representation of freedom and possibility that it has become a starting or staging point for investigation of what may well be the world’s last great frontier. Some fly in from Seoul or Beijing to join the daily sleeper train that connects with the Trans Siberian and will take you past Lake Baikal to Vladivostock, Russia’s easternmost port. Others venture off toward neighbouring Kazakhstan, Manchuria, or the bordering Russian republics of Tuva, Buryatia and Altai, each with its own array of compelling terrain and societies. A Hamburg To Shanghai car rally snakes through the country during the summer (few would dare it during the winter harshness). Horses remain a constant as you shake the dust off your boots in Ulaanbaatar and prepare to depart. 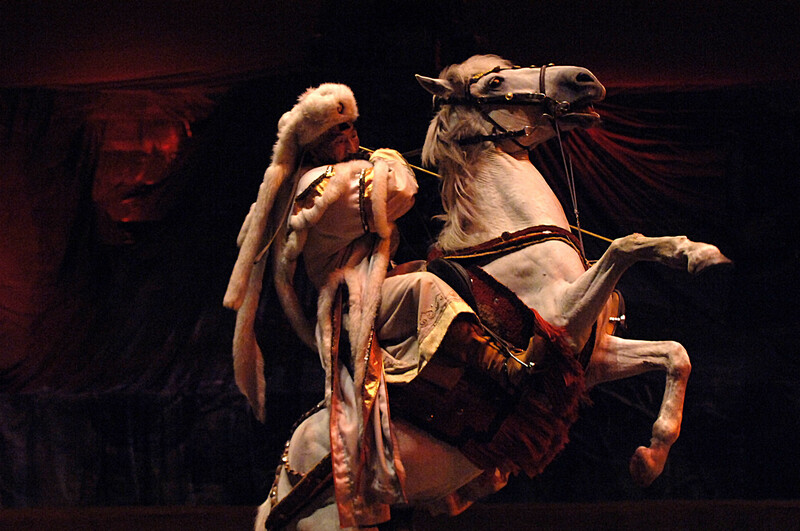 You can see them prancing near acrobatically indoors in the city, bringing to life tales of Genghis and his Mongolian hordes through handlers of far calmer demeanor. You are never allowed to forget just where and in whose company you are.